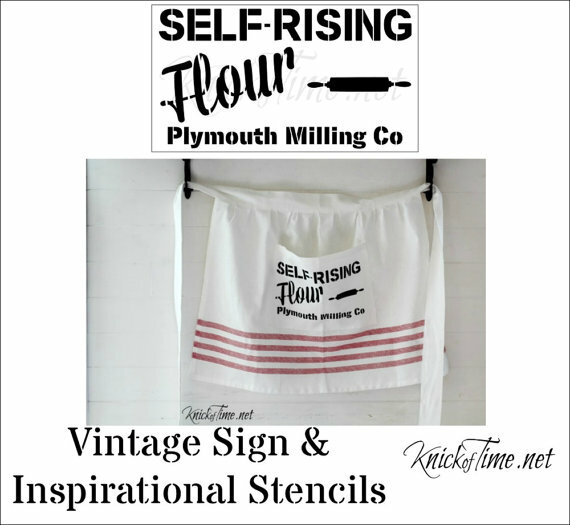 Self Rising Flour Sign with Knick of Time Stencil! This $1 garage sale rolling pin inspired my latest project. The rolling pins ends became hooks on a new kitchen sign. 1. I started with a pine board 11 1/2" x 24". 2. I base coated the board with Rustoleum Satin Paint in Canyon Black. 3. Next I painted on two coats of Annie Sloan in Country Grey. 4. I used the large size Self Rising Flour Stencil from Knick of Time.net. 5. I used black, white and tomato spice acrylic craft paint for the stencil I applied with a stencil brush. 6. I then distressed the sign with 100 grit sandpaper on the edges and 220 in the center. 7. After cutting the rolling pin with a chop saw, I painted the ends with the tomato spice paint and attached them to the back of the sign with screws. 8. Then I added sawtooths for hangers in each back corner and waxed the sign with Decoart Creme wax. I love it too! The rolling pin was such a clever addition. Wow, what a great collection, what a wonderful display. Love your sign. It turned out great, Carlene! I love the red touches. Turning the rolling in into hooks was genius - it turned out beautiful and looks great with your collection of rolling pins. So glad you came up with a fun project to use the flour stencil on! Pinning it to the Vintage Sign Stencils board! So, so cute --I love those rolling pin handle hooks. Thanks for linking up to The Talk of the Town party! I love how this turned out, Carlene...cheery and functional! Love it Carlene ... clever use of the rolling pin handles. This is so cute! I love the way you made use of the stencil!